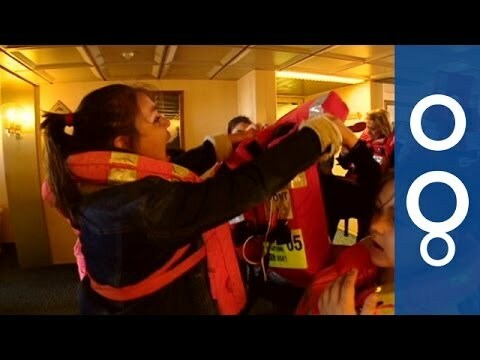 Ship evacuations sometimes turn chaotic, ending in tragedy. In this episode of Futuris, we look at why this happens and what can be improved with new technologies. To date, a paper plan of the decks has been the captain’s main reference in an emergency. But it doesn’t show where the passengers and crew are located at any given time. If some areas are inaccessible, there may be no way of knowing if there are people trapped inside the ship. Vassilis Gazikas, director of marine operations at Louis Cruises, explained the process. A range of technological solutions is being developed, aimed at making ship evacuations faster and more organised. Engineers from several countries have joined forces on this European research project. Tasos Kounoudes is an electronics engineer and the CEO at SignalGeneriX. He and the LYNCEUS project team he manages are working on a new, faster way of locating a ship’s passengers and crew during a voyage. To make this possible, researchers have replaced ordinary smoke detectors with a newly-developed version. These new smoke detectors also create a wireless network across the whole ship. The latest technology also enables the real-time tracking of the tags on the life jackets. The current location of each person on board is transmitted to the captain, so decisions can be taken much faster. Antonis Kalis, SignalGeneriX’s head of telecommunications and wireless sensor networks, outlined the new system. Rather than searching through printed lists of passenger names, the crew can identify and count each evacuated person using a convenient hand-held device. The same smart tag can be worn as a bracelet, so the person can be found even if there’s no emergency. But that’s not its only function, as marine engineer and president of the Maritime Institute of Eastern Mediterranean, Zacharias Siokouros, illustrates. But how could the crew find someone who has fallen overboard and is therefore no longer within the ship’s wireless network? Many shipwreck victims die from hypothermia before they are found. But researchers have developed devices that reflect radar signals, meaning the location of every victim in the area can be triangulated. Markus Schulz, a research engineer in integrated circuit design at Dresden University of Technology, demonstrated the technology. The new, compact and low-power wireless devices can make emergency operations in the sea faster and better organised; preventing panic and saving lives.